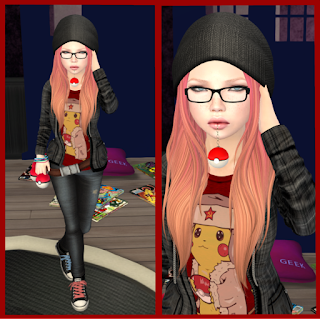 Ramblings of an SL Shopaholic: Gotta Catch Em' All. First blog ever! Yaaaay and stuff! Alright, so I'm a dork, I love the Pokemon, and when I saw this hoodie and shirt by [Exiled Inc.], I admit I squealed a bit, maybe even danced around in my chair as I sang the Pokemon theme song obnoxiously loud and off key, cause I mean c'mon.. lookit it! AND the belt, lookin' that belt with all those Pokeballs, it's by Loki, and best part is it's FREE, awww yeah. But, I won't bore you with all the details on how I fangirled over this. I'll just list the darn credits for you! Glad you like the hoodie <3 looks super cute on ya!